Medicare is as Canadian as hockey and McIntosh apples. All across the country people of all political persuasions treasure the right to necessary medical care whether the patient has the money to pay for it, or not. This is the way it has been in Canada for almost 40 years. No need to buy expensive private insurance to ensure medical bills will be paid. No need to figure out which treatment you can afford if your child is diagnosed with cancer. No need to sell the house in order to pay thousands of dollars worth of expenses if you are hospitalized by a serious car accident. Instead of loading medical expenses onto individuals and their families we chose to pay for it collectively through our tax system so anyone who needs medical care can have it. This is the Canadian way. If you are a patient in an intensive care unit you get the nursing, medications, and surgery you require regardless of whether you are a single mother on social assistance or a corporate lawyer. In fact, in a Canadian intensive care unit there is no way of telling who is wealthy and who is poor. Perhaps we have become so accustomed to Medicare, and so frustrated with its short comings, we have forgotten how privileged we are in Canada to have this sort of health care available to everyone. 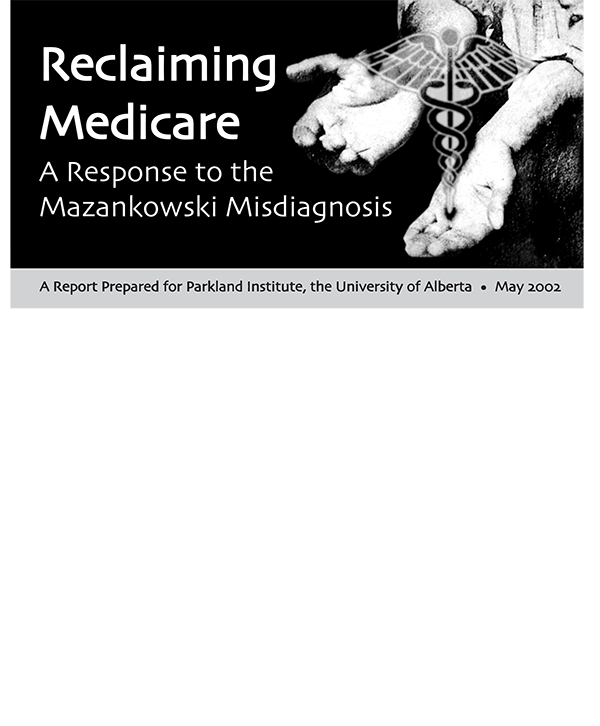 Perhaps we have forgotten that Medicare came out of Saskatchewan, a province where tough, but often poor people, living in a harsh environment recognized that they had a better chance of living well, and seeing their children live well, if they pooled their resources and created a health care system that would be available to everyone, not just a privileged few. Perhaps we have forgotten because there is such a determined effort on the part of insurance companies, for-profit health care corporations and some politicians to make us forget. To make us believe that public health care isn’t working and we can’t afford it anyway. To make us believe that the private sector can provide health care better than the public sector even though Canada already has one of the best public health care systems in the world. So instead of talking about the best way to make good health care available to anyone who needs it we find ourselves talking about health care as though it were a business or an industry. Words such as sustainability, competition, choice, rationing and monopoly now frame the debatea bout Medicare. These words turn up again and again in the report prepared for the Klein government by a task force headed by Don Mazankowski, former federal minister of privatization and a paid board member and shareholder of private insurance companies. Senator Michael Kirby, also a director of Extendicare, one of the largest for-profit providers of long term care in North America, heads up a Senate Committee that is also looking at health care. Reports from this committee are also seeded with business terms. Premier Ralph Klein talks publicly about patients as customers or consumers. If we are going to maintain, and reform, a publicly funded, universal health care system we must reclaim the language of Medicare. And the first step is to expose the fuzzy phrases and jargon being used by the enemies of Medicare to lull us into believing that publicly funded, universal health care is a second rate idea that costs too much. So far the enemies of Medicare are winning the war of words. Just listen to TV newscasts or read a newspaper and see how often the language of business pops up in stories about health care. If we fight on their terms we will lose. We will be embarassed into believing that public health care couldn’t possibly be as efficient, up-to-date and well-funded as a privatized, or business model. We have to turn their arguments upside down. We have to insist that Medicare is not a business, it is healthcare provided to people in need. The providers receive money for their services, but unlike profit-oriented businesses this is not what motivates them. With Medicare physicians don’t need to create patients like businesses need to create customers. We can easily understand that little harm is done if MacDonald’s convinces thousands of people to eat more hamburgers than they really need. But can we say the same for clinics who need to create lots of patients and provide them with medical treatments that guarantee investor sat least a 15 per cent return, every year if they are to make money. We need to insist that patients are not consumers who can look around for the best deal. They are sick people who need help and cannot simply get out of bed to “go shopping.” We have to insist that it’s not good enough to simply say Medicare is “unsustainable” therefore we have to abandon it and start loading costs onto individuals and their families as recommended in the Mazankowski Report. If we want Medicare, and most Canadians do, then we have to find ways to keep it. That has to be the first premise. That’s why the Parkland Institute is publishing this primer. And as you read through it you will rediscover the language of Medicare. The fuzzy phrases and jargon used by the enemies of Medicare are replaced by clear ideas and words. Complex bafflegab is exposed for it really is - double speak intended to confuse people and then sell them something they don’t want - or need - in the first place. A simple question and answer format is used so readers can get to the point quickly and move through the material easily. Take this booklet with you next time you go for coffee with a friend. Use it to make a point during your next conversation about Medicare. When you hear a politician or a for-profit health care lobbyist use the language of business ask them what they mean. Ask them to explain the words they use. Ask them why they insist on talking about Medicare as a business. Let’s take back the language of Medicare.